I’m not comfortable with either major party candidate. That’s part of the reason I’ve been disengaged this presidential election. I like to consider myself a fairly informed person, but this election season I just want to dust my hands and say “Enough!” (And I am not the only one who feels this way.) This from a woman who usually chastises people for not being good citizens and engaging in public policy discussions. But I fully intend to vote, so I need to make up my mind. In fact, I intend to vote TODAY, the last day of early voting in my state. 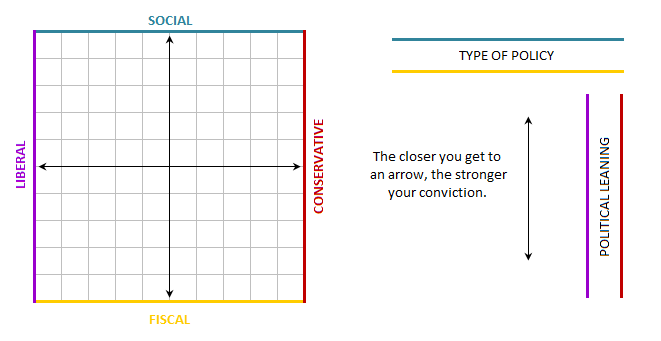 In order to make up my mind, I’ve been thinking a lot about where I fall on the liberal-conservative scale. Some people like to think these two dimensions have nothing in common, save they both contain “er”. But I think that’s too simplistic. I think political leanings are complex and may vary depending on the issue at hand. So I’ve been thinking about how to…well, how to think about my political thoughts. Uh. I’m sure there’s a better way to say that, but nothing comes to mind right now. There is a political compass that you can use that helps you decide if you want an authoritarian or libertarian government (on a social scale) or left or right (on an economic scale). This is interesting for looking at global and historical politics, but the categories are not unique enough for American politics, IMO. 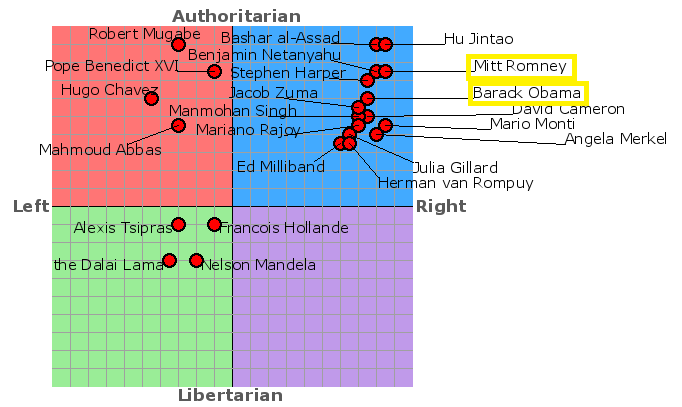 I mean, look how close Romney and Obama are on this compass. Accurate or not, this does not help me make a decision. So I made up my own compass. On my compass, you plot two points, one in the top half and one in the bottom half. The top point represents your social ideology and the bottom one your fiscal, instead of one point encompassing both. 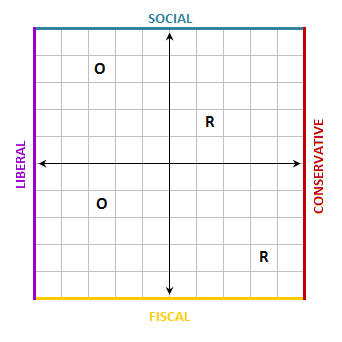 The horizontal scale represents your conservative/liberal leanings, and the vertical axis represents how important social/fiscal policy is to you. 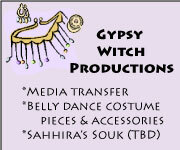 It’s less about finding an easy category for yourself and more about the process of choosing two points. You have to think about what matters to you and whether or not it will contribute to your vote. The longer your line is, I suspect the harder it will be for you to choose a major party candidate. For me, the fiscal half is the harder half to peg. No one is a true fiscal liberal a la “Let’s throw a kegger with our tax dollars!” I think this label gets hoisted on those of us who think social or public services are worth federal dollars. I’m labeling social and fiscal as types of policy, but it’s difficult to have one without the other. For example, if you support more open immigration policies (a social liberal stance), how much money are you willing to spend to monitor an open immigration policy? Are you willing to spend a lot (fiscal liberal) or are you willing to spend very little (fiscal conservative)? If you support closed immigration policies (a social conservative stance) how much money are you will to spend to prevent people from entering the country and returning illegal immigrants home? Are you willing to spend a lot (fiscal liberal) or are you willing to spend very little (fiscal conservative)? I think Obama and Romney fall here (see chart) in general. I’m no political analyst mind you, but this is my best guess based on the debates and the candidates’ campaigns. Although, I am not sure where to put Romney socially. He’s waffled more than a few times. I probably could have thrown a dart at the top half and pegged Romney at any given time. While I haven’t been happy with all of Obama’s presidential decisions, I don’t feel like he’s waffled to the same extent as Romney. Now if i were to make a separate grid for all the major issues that pop up during presidential races (i.e., abortion, education, immigration, health care, foreign policy, etc. ), the candidates’ pegs may shift a little. Just like they shift when I try to plot myself. Which I am still trying to do. One of the things I have been asking myself is, “Can you be Pagan and be socially conservative?” For most Pagans, our faith has a strong component of personal responsibility and the ability to make your own choices and accept consequences. This concept of self responsibility translates well to the idea and practice of tolerance and an appreciation for diversity (of most kinds). And for many of us, the idea and practice of tolerance comes from personal experience, not just personal philosophy. I think many Pagans have faced or feared social (and sometimes economic) consequences for being openly Pagan. That being said, I’m sure there are socially conservative Pagans out there and I’d be interested to hear about their political beliefs. For my part, I’m wondering if my vote wouldn’t be better spent supporting efforts to bolster the Libertarian party. I don’t agree with all Libertarian leanings, but I do tend to agree with Libertarian interpretations of the Constitution. And that’s really important to me. If 5% of the American populace votes Libertarian in the presidential election, the Libertarian Party will gain access to general election funds. This has nothing to do with the electoral college; a simple 5% of voters across the country will do it. And in doing so take a significant step towards forcing a third party on our legislators. I believe a two-party system is clogging the political works right now and a third party would force genuine compromise. Another reason why I might vote for Gary Johnson, a Libertarian candidate, is because he gave interviews to several Pagan news outlets earlier this year. That’s pretty cool. What do you think Realm? How do you decide your vote? Do you have any political tools like a compass you’d like to share? Thanks B! This was a neat site. And mostly confirmed my Libertarian leanings. I am a strong Obama support and have supported his campaign monetarily both this year and in 2008. That said, he has no hopes in winning Oklahoma. I would have voted for Gary Johnson to bolster third parties except our state supreme court prevented him from being on the ballot. America Elects was able to secure a spot on our ballet but the national group fell apart before selecting their nominee. Hi Thornwald! You are just “up the road” from us. 🙂 We’re in Texas. Gary Johnson is on 47 ballots plus the District of Columbia. You happen to live in one of the three states where he didn’t make it on the ballot — Oklahoma, Pennsylvania and Michigan — because of a technicality.